How do you like your caffeine? With cream & sugar? Black? Or with Citicoline, Bacopa, L-Theanine, L-Tyrosine, & B Vitamins? That’s right, my fellow nootropic geeks, our caffeine comes with options these days. And right now I’m checking out two of those options: Profiderall, manufactured by Profiderall Laboratories, and Doxiderol, by our dear friends at Mentis Labs. 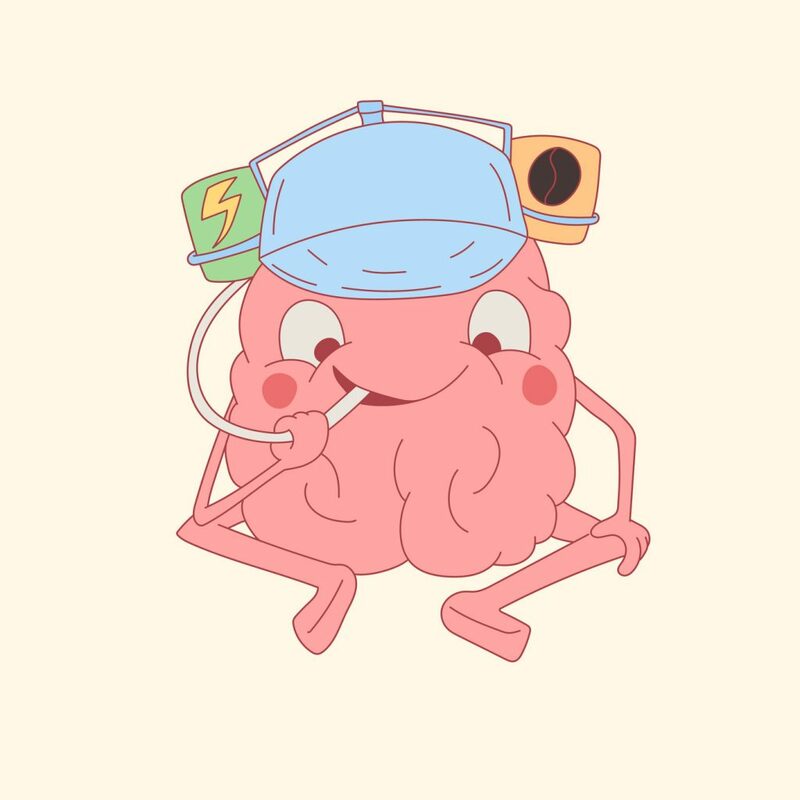 Now I know what you’re saying: Caffeine isn’t a true nootropic. And you’re right. But perhaps there’s more than meets the eye with these formulas. Unfortunately, we’ll never fully know, because both formulas are trapped in proprietary blends. 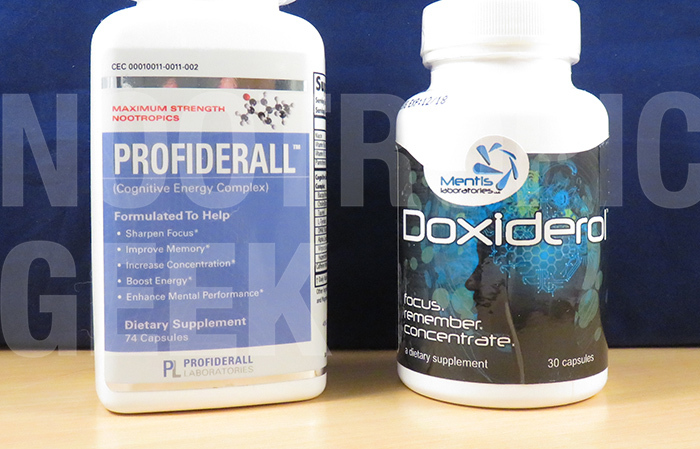 Profiderall or Doxiderol: Which is better? Caffeine & nootropics. There’s a quick review of both Profiderall & Doxiderol, two proprietary blend formulas of questionable value. I say questionable because all proprietary blends are questionable, due to the question: What are the ingredient dosages? Of these, there’s slight nootropic potential, particularly on behalf of the Vitamin B6 and L-Tyrosine. But it’s hard to tell without L-Tyrosine’s dosage. Additionally, we have Bacopa Monnieri, DMAE, Vinpocetine, & Huperzine-A, which operate as bona fide cognitive enhancing nootropics. But again: Dosages. Read my in-depth review on Profiderall. This isn’t bad, but if it were up to me, I’d rank Citicoline at number 1, possibly Bacopa at number 2, because those are the best nootropics in this blend. Even so, Doxiderol seems to supply more nootropic power per ingredient than Profiderall, which is why Doxiderol reads more like a student’s supplement (i.e. Adderall alternative) than an energy drink alternative. Read my in-depth review on Doxiderol. Profiderall & Doxiderol in a nutshell. B Vitamins. Both products supply B vitamins, but Profiderall supplies more B vitamins at much higher dosages (although, their quality could use improvement). L-Tyrosine. This isn’t quite the N-Acetyl-L-Tyrosine form I was looking for, but it is L-Tyrosine, a popular amino acid for sustaining focus during stressful conditions. DMAE Bitartrate. 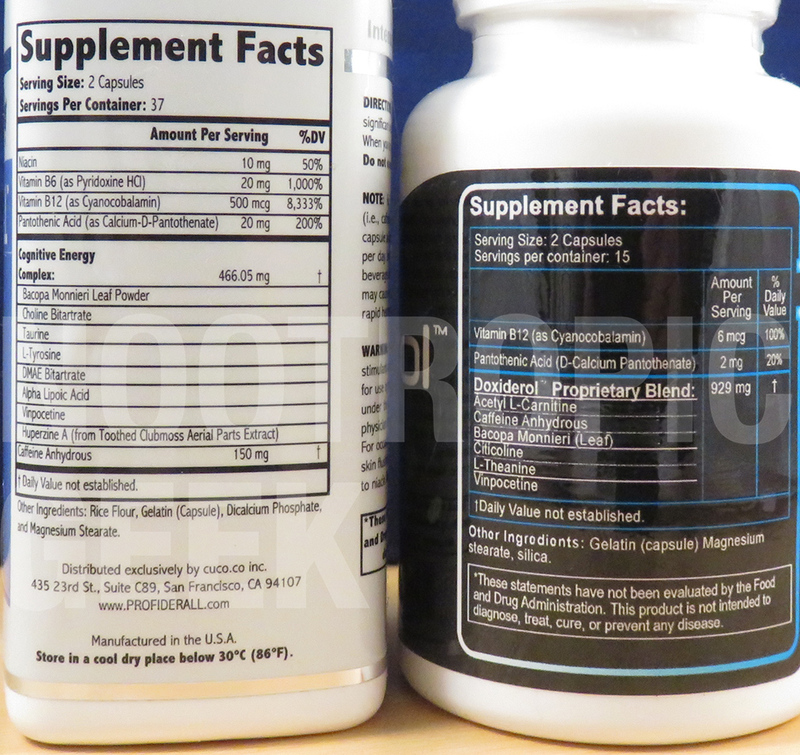 Decent nootropic compound, believed to serve various biofunctions related to brain chemicals & brain waves. Huperzine A. Doxiderol has the Vinpocetine, but not the Huperzine A, another potent nootropic that requires only tiny doses for significant bio-effect. Acetyl-L-Carnitine. Unlike regular L-Carnitine, ALCAR is able to cross the blood-brain barrier, potentially delivering its energizing benefits to neurons as well as the body. Bacopa Monnieri Extract. Compared to Profiderall’s Bacopa powder, Doxiderol’s Bacopa extract is of a higher quality & potency. Great for memory. Citicoline. One of my favorite choline sources and nootropics for its mental supercharger status and various brain health benefits. L-Theanine. An excellent complement to caffeine for its ability to relax the mind without obstructing focus. It keeps the energy, but removes the edge. Of course, the required dosage of each ingredient varies, yet we’re looking at nearly 3 times the average ingredient dosage in Doxiderol’s blend over Profiderall’s. So Doxiderol likely has the better dosages over Profiderall due my guesstimation. But you know what I don’t have to guesstimate: Doxiderol’s better quality & potency. I’m not entirely sure why Profiderall Laboratories included Choline Bitartrate in their formula (it’s non-nootropic), but they should have gone with either Citicoline or Alpha-GPC (preferably Citicoline). The remaining ingredients in both formulas are either par or sub-par value. I’m saying “cheap” in both the negative & literal sense: The ingredients are of cheap, weak quality, and the formula is cheap $$$-wise (at least compared to Doxiderol). As a nootropic, Profiderall has minimal value. It theoretically has enough working parts to give it a nootropic edge, but its poor design & potency miss the mark. Instead, view it as a healthier energy drink alternative. Doxiderol is still a “cheap” supplementation, and I mean this more in the negative (versus literal) sense. It’s clearly more expensive than Profiderall, but this is at least warranted by its better quality, higher dosed ingredients. Citicoline is a surprisingly rare ingredient, considering how valuable it is as a nootropic. So props to Doxiderol for tossing that in there. Pity it’s prioritized below caffeine, but what can ya do, ehh. Perhaps my tastes have been spoiled by too many sweet nootropics, but then again not really: I’m the Nootropic Geek, baby. I’ve got standards, dammit. And on a few measures, both Profiderall & Doxiderol don’t meet my standards of an “excellent nootropic.” With Profiderall it’s somewhat forgivable due to its lower price (although, it’s really not that low), but regardless of the price, when I take nootropic supplements, I like them to work. I’m not entirely convinced that these work in the way that nootropics should. My hunch tells me that what I’m comparing here are essentially healthy caffeine pills–an oxy moron, sure, but earned by the healthy herbs, aminos, & compounds in both of these proprietary blends.